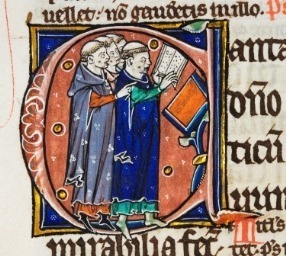 How did the medieval monks of Durham celebrate Maundy Thursday? A work known as the Rites of Durham – a late 16th-century account of the earlier, pre-Reformation rites and practices of Durham Priory (now Durham Cathedral)* – records an intriguing but appropriate ceremony carried out by the monks for Maundy Thursday. Durham Cathedral MS A.II.10, fol. 224v. © . Chapter of Durham Cathedral. Decorated initial from Peter Lombard’s commentary on the Psalms. The ceremony involved three parts: the washing of the feet, the setting up of the Paschal Candle, and the Judas Cup. The first of these started at 9 in the morning, when 12 poor men were brought into the cloister and were seated on a ‘broad thicke fourme’ or bench supported by three wooden pieces which was brought in from its usual place between two pillars standing over and against the south quire door. For more information on the architecture of the Cathedral mentioned in the extract, including the cathedral cloister, the Te Deum Window and Prior Castle’s 16th-century clock, go to https://www.durhamworldheritagesite.com. *More information on the manuscript of the Rites of Durham may be found here: https://www.durhamworldheritagesite.com/history/rites-of-durham. **John McKinnell, The Sequence of the Sacrament at Durham (The University of Teeside, 1999), p. 11. ***The text comes from the Rites of Durham, being a description or brief declaration of all the ancient monuments, rites, & customs belonging or being within the monastical church of Durham before the suppression: Written 1593, ed. J. T. Fowler, Surtees Soc. 107 (Durham: Andrews & Co., 1903), pp. 77-78 (‘XXXVII. THE CLOISTER. MAUNDY THURSDAY.’).